Chicken is the main meat source that my entire family eats; so, I'm always looking for new ways to switch things up! This recipe is a keeper! Break open eggs into a shallow dish and scramble well. In a medium mixing bowl, combine bread crumbs, parmesan cheese, sea salt, black pepper, lemon pepper and oregano. 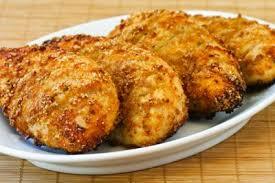 Dip each side of chicken breast into the egg and then into bread crumb mixture. Place in a large baking dish. Bake at 350 degrees for 45-55 minutes, or until the internal temperature reaches 165 degrees F.
Serve with some brown rice and steamed veggies and you are set!